When ice turns directly into water vapor without first transitioning into a liquid, it is referred to as "sublimation." In fact, any solid that turns into a vapor without going through the liquid phase can be said to sublime or "sublimate." Below the melting point temperature, at which point water will turn into water, ice can sublime - that is, transition from a frozen state directly into a vapor state. Sublimation of ice can be demonstrated in hanging a wet sweater on a line in freezing temperatures. Although it may take a few days, the wet clothing article will eventually dry out. Snow, which is a particular type of ice crystal, can also transition directly into water vapor. On cold, gray days even when it's too cold for snow to melt, it will eventually sublime into the air as water vapor. Freeze-drying uses the process of sublimation to preserve certain materials, particularly food items. "Astronaut ice cream," for example, uses sublimation. The material to be freeze-dried is frozen and then placed into a vacuum or under low pressure and the moisture is allowed to sublime. Glaciers are giant chunks of ice that covered the entire globe during the Ice Age, and still exist. Glaciers experience a particular form of sublimation called ablation. Ablation is the process wherein the snow and ice of the glacier slowly begins to turn into vapor. A few materials other than ice experience sublimation as well. Here are some examples of other types of sublimation. Carbon dioxide gas can be frozen into a block commonly known as "dry ice." 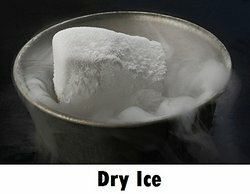 Although it's not the same as the ice in your drink, dry ice experiences sublimation in a very similar way (although it's not nearly as slow). It sublimes directly into carbon dioxide gas without changing into a liquid form. Iodine, an element used in nutrition and manufacturing, can also sublime under certain, special circumstances. Sublimated iodine fumes can reveal fingerprints in forensic research. At very high temperatures, the dangerous element arsenic can sublime. How high must the temperature be? Sublimation of arsenic only occurs at temperatures above 1100 degrees Fahrenheit. Naphthalene is an organic compound that is primarily known to the average person as the main ingredient in mothballs. This compound sublimes very well - as a matter of fact, engineering students often study naphthalene vapor as a means to better understand large scale sublimation. Ferrocene, an orange colored organometallic compound, is able to sublime - particularly when placed into a vacuum and heated to a high temperature. The hydrocarbon anthracene, a coal tar component that can be used to make red dye, is a compound that can sublime. Pyrene is apolycylic aromatic hydrocarbon that can sublime at certain pressure conditions and temperatures. Now you have lots of examples of ice to water vapor, as well as some examples that illustrate how the process of ice to water vapor works. "Examples of Ice to Water Vapor." YourDictionary, n.d. Web. 18 April 2019. <https://examples.yourdictionary.com/examples-of-ice-to-water-vapor.html>.